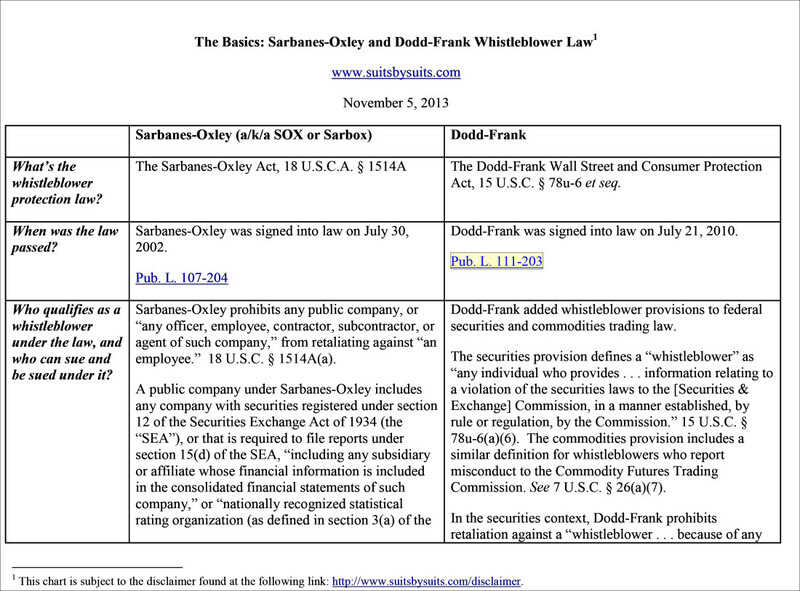 The Dodd-Frank and Sarbanes-Oxley whistleblower laws are hot topics right now. A split of authority is developing in the federal courts over how an employee can qualify as a whistleblower and bring a retaliation claim under Dodd-Frank. And the Supreme Court will hear argument next Tuesday in a case, Lawson v. FMR LLC, that will require it to decide whether private employers can be subject to Sarbanes-Oxley retaliation claims by their employees. As we at Suits by Suits continue to watch these issues, we thought it would be helpful to step back for a broader view of these important whistleblower laws. In the table linked here, we have summarized the important facets of each law. This table will serve as a reference point for new developments, placing them in the broader context of these whistleblower protections.